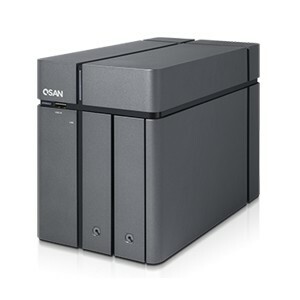 หน้าหลัก>QSAN XCubeNAS XN3002T Efficient NAS ensuring data availability and integrity. Efficient NAS ensuring data availability and integrity. The XCubeNAS XN3000T Series are simple, solid, and stylish NAS systems which are designed for Workgroup and SMB applications. The XCubeNAS is powered by specific hardware N+1(3.5’’ LFF xN + 2.5’’ SFF x1) design, with an additional onboard SATA SSD slot for blazing performance and capacity expansion that can benefit every workgroup and SMB user. The latest processor: With high performance Intel Celeron processor to provide abundant resources to meet computational requirements of a wide variety of applications. Up to 2 x 1 GbE network interface: Built-in two 1GbE Ethernet ports which meet iSCSI/NFS/CIFS network data transmission requirements. The innovative mechanical design makes the XCubeNAS a versatile hybrid storage device. Without affecting existing large form factor slots, the XCubeNAS positions small form factor bays for SATA SSD at the left side of the system. 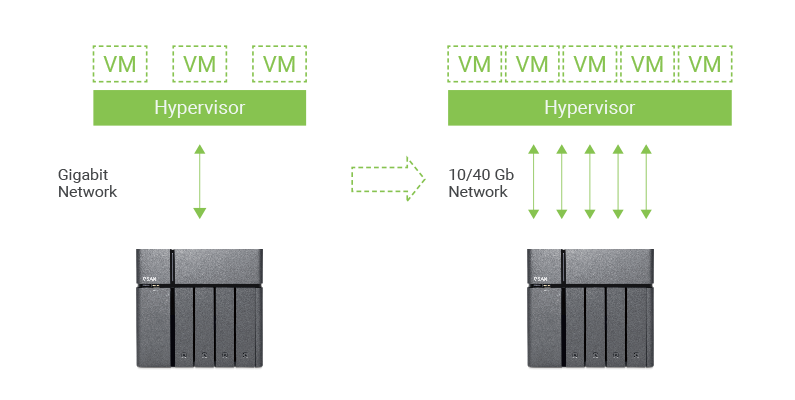 This way, we can ensure that both the demands for capacity and performance can be satisfied. 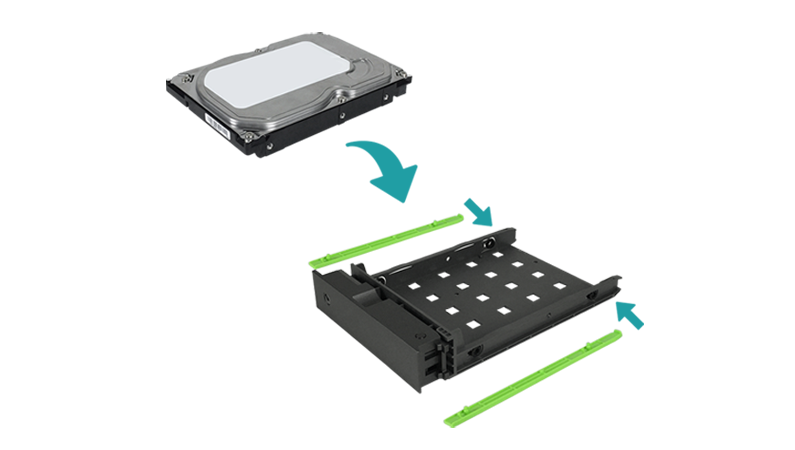 N : Large Form Factor: Large form factor slots drive trays feature not only 3.5 inch drive support but also 2.5 inch mounting holes are included as standard on all bays on the XCubeNAS. 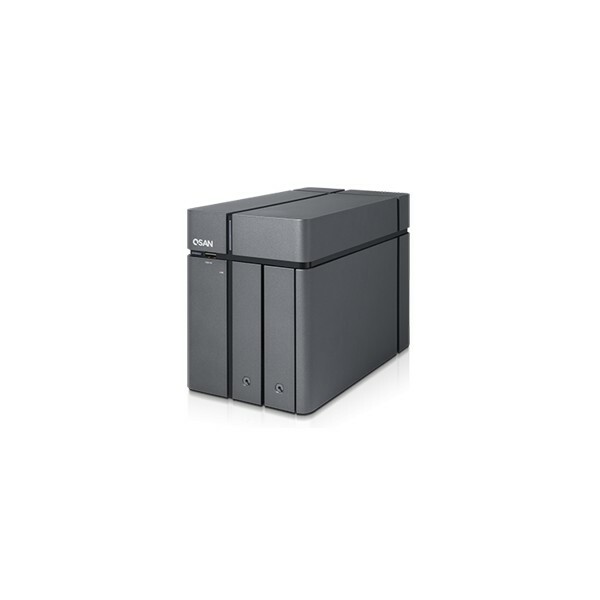 Fitted with up to 10TB drives in the 3.5 inch HDD bays, the XCubeNAS can fulfill capacity demands and exceed them after adding our XCubeDAS systems. 1 : Small Form Factor: Additional 2.5 inch small form factor are provided in order to enable advanced features without sacrificing storage capacity. 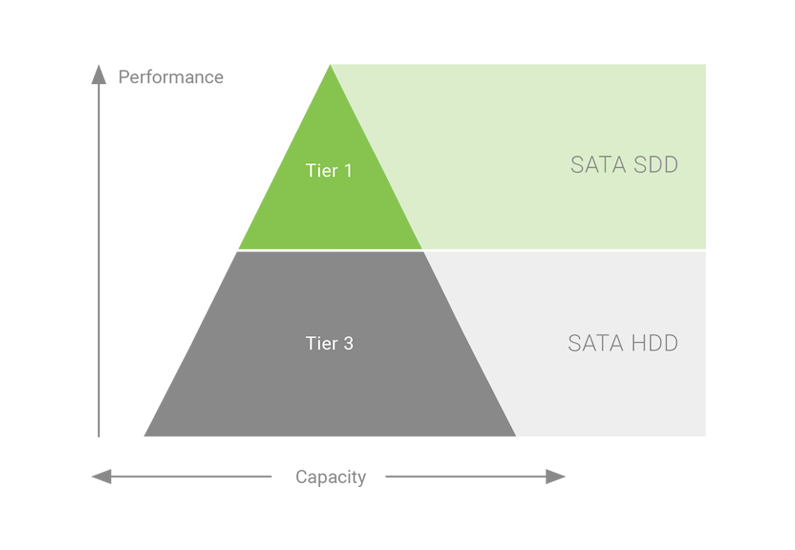 In addition to being used for SSD caching for boosting data access performance, our auto-tiering architecture can be utilized to offer a complete ongoing optimization. With our screw-less tray design for 2.5" SSD and 3.5" HDD trays, anyone can install the HDD and boost up performance without any IT background. XN3000T Series are built with 4GB DDR3L SO-DIMM RAM which can be easily expanded to up to 8GB without using any tools. It’s important for users to easily operate and manage the XCubeNAS. With the simple, clear, and intuitive interface with graphic icons and a tablet/phone-like interface, the XCubeNAS is easier and more pleasant for everyone to use without any professional knowledge. Furthermore, QSM's exclusive design Dock is the bar of icons that sits at the bottom. 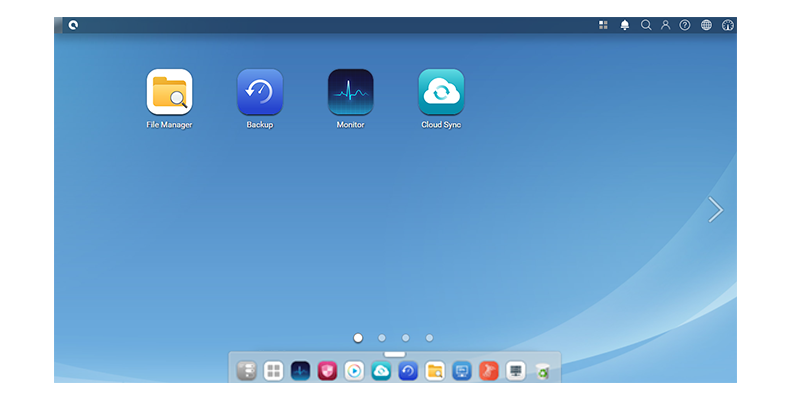 You can pin your most accessed app on Dock, providing an easy way to access your QSM. Users are allowed to create multiple user accounts and share folders, and authorized by those shared folders with the support of privilege settings. There are features that IT administrators can use to set the access control on the XCubeNAS. With the powerful QSM 3.0 file system and intuitive interface, IT administrator are able to efficiently manage account, storage, network bandwidth, monitor the activities occurring on the XCubeNAS, and react on a moment’s notice if something goes wrong. XN3000T Series tailor-made storage pool technology effectively caters to diverse storage demands on data integrity, scalability, high performance and availability. 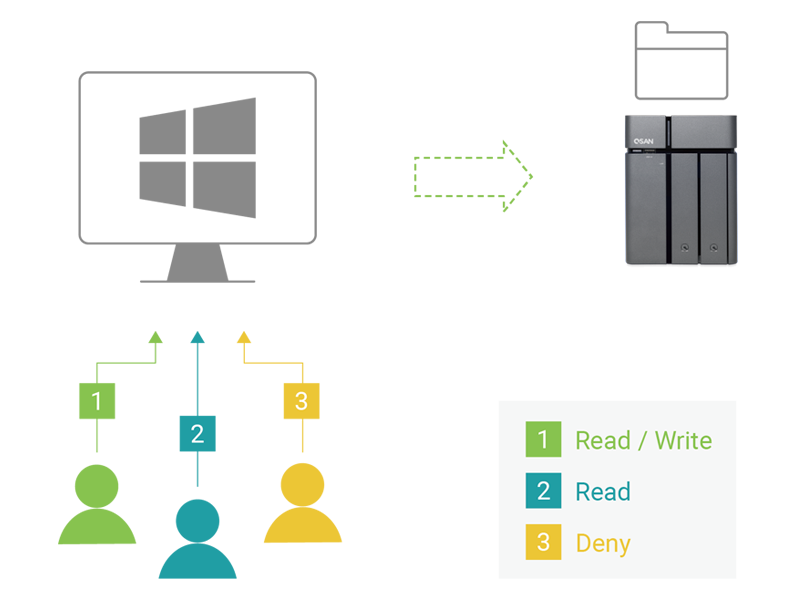 Comprehensive RAID levels are supported to ensure data integrity under every application scenario. Pool capacity could be expanded on the fly, rapidly responding to growing needs for capacity. The design of the XN3000T Series allow for creating customized storage pools and auto categorization of data based on usage. “Hot” data will be moved to front line storage while “cold” data is stored on slower disks. All this is done automatically with the XN3000T Series. 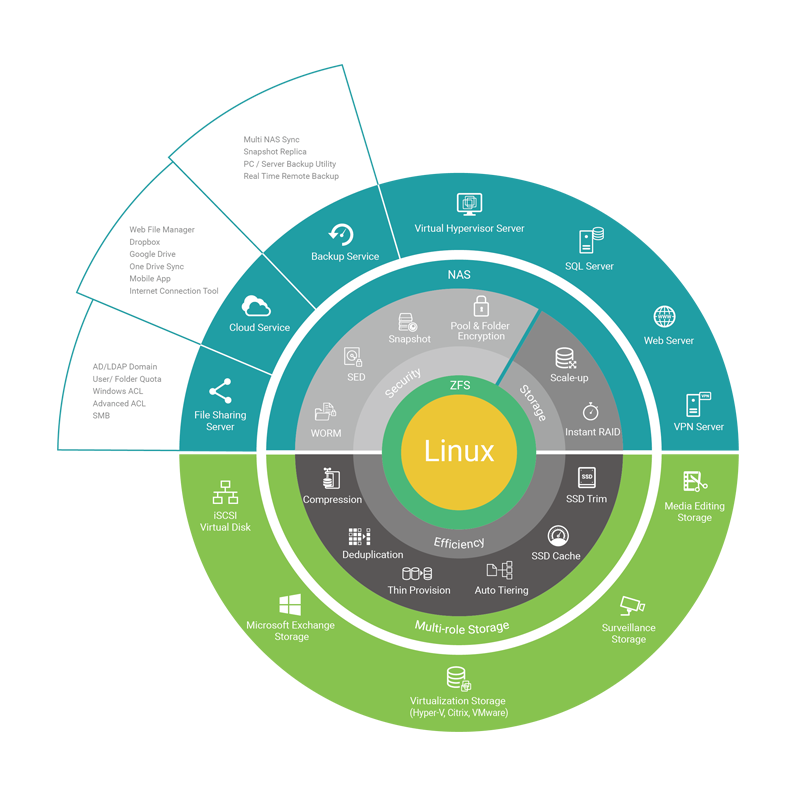 XCubeNAS is verified with VMware ® Ready™, Citrix ® Ready™, and Microsoft ® Hyper-V™ certified. 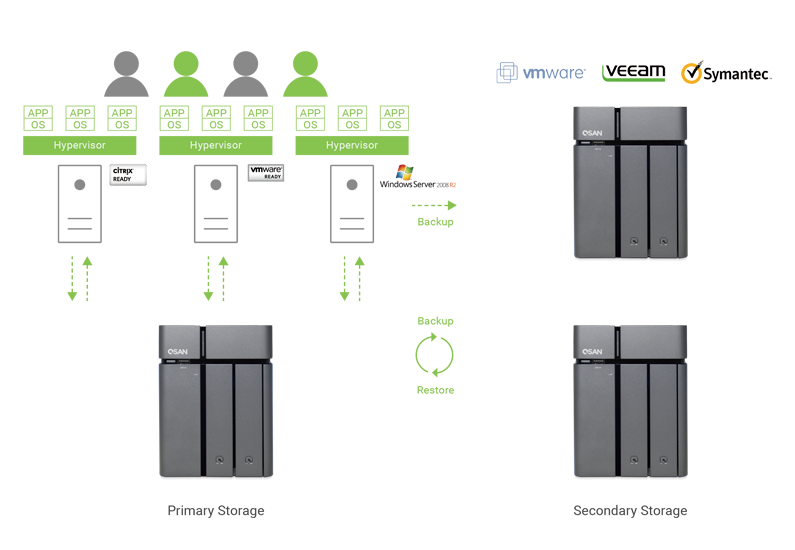 No matter which virtualization environment you’ve adopted, the XCubeNAS is a practical and efficient storage system for you to deploy in any virtualization platform. 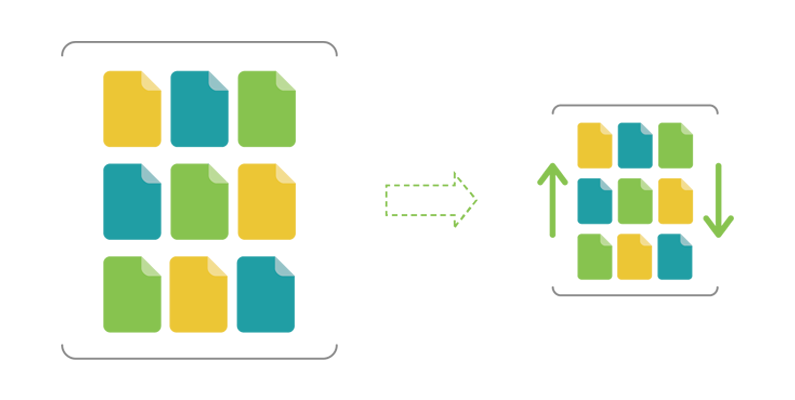 XCubeNAS can be used for primary storage repositories and as a backup to existing primary storage. 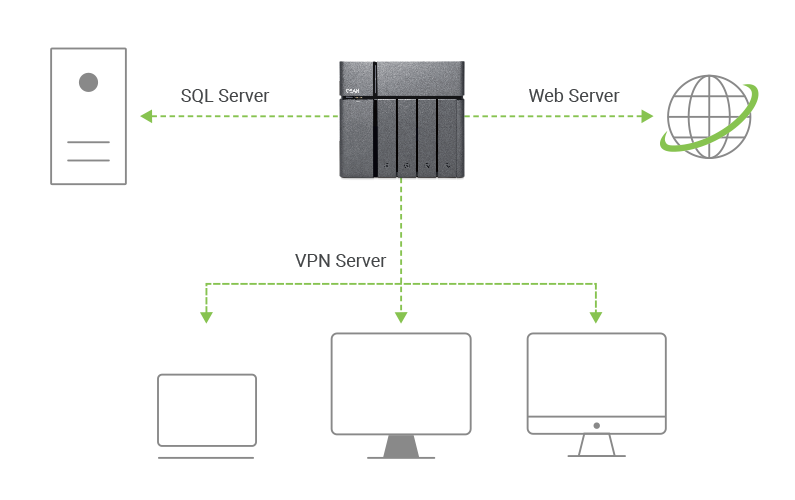 As a backup storage device, the XCubeNAS supports a comprehensive list of 3rd-party virtual machine backup software to ensure that your VMs and data are never at risk of loss. By using auto-tiering, it helps increase the performance of your business application without crippling your budget. The XCubeNAS features auto-tiering technology which makes the system continuously analyze the accessing frequency of your data for better data transmission. The most frequently used data will move to higher speed tier, on the other hand, the less commonly used data will move to capacity tier. 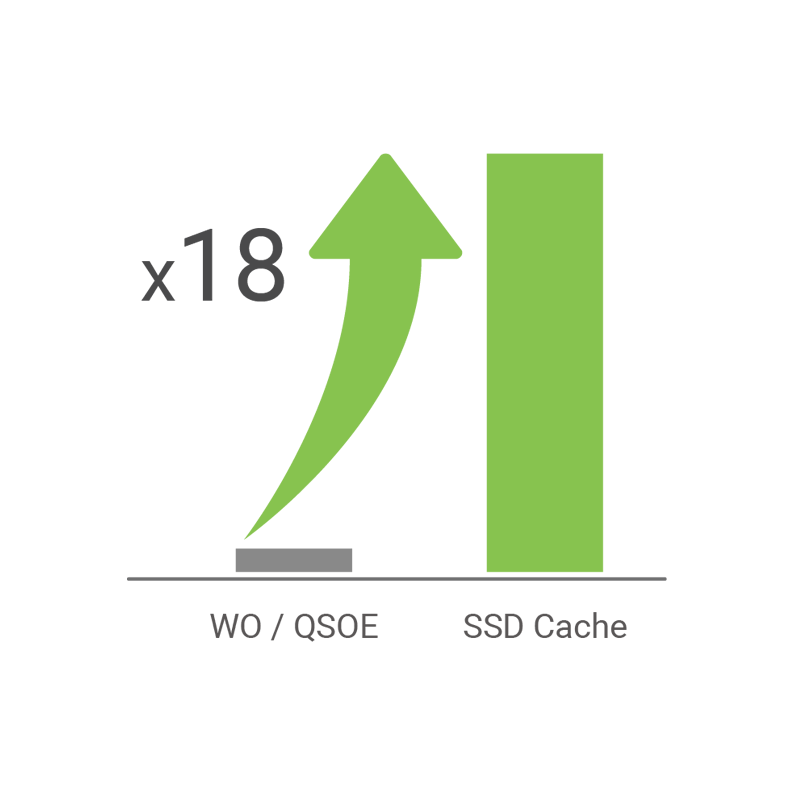 Demanding workloads of your business applications could be dramatically reduced, and the performance increased without massive investment in expensive all flash storage devices – this is all done by the XCubeNAS’ intelligent auto-tiering technology. The XN3000T Series provide lightning fast and secure ways to share files with anyone, anywhere. You can explore, organize, and move files between your computer and the XN3000T Series, all the while, being able to customize access rights to enhance security. 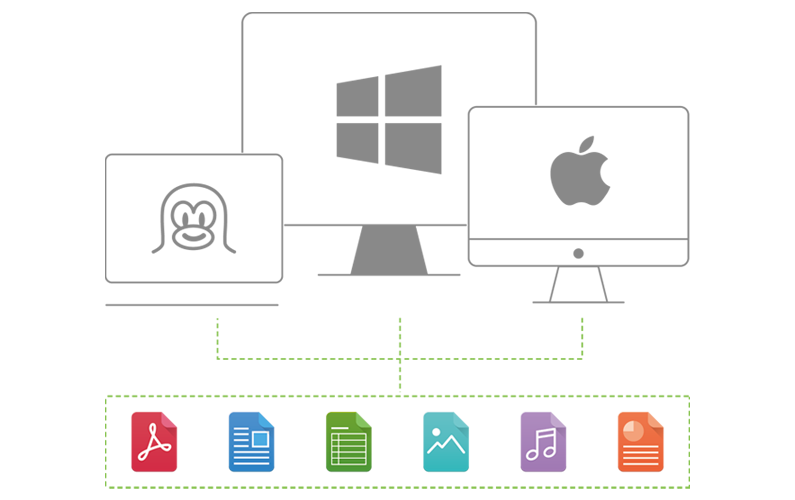 A seamless integrated system allows for file sharing across different computing environments, including Windows, Mac, Linux, Android and iOS. Take control of your storage space by adding quotas (limits) to the amount of data a user can store. 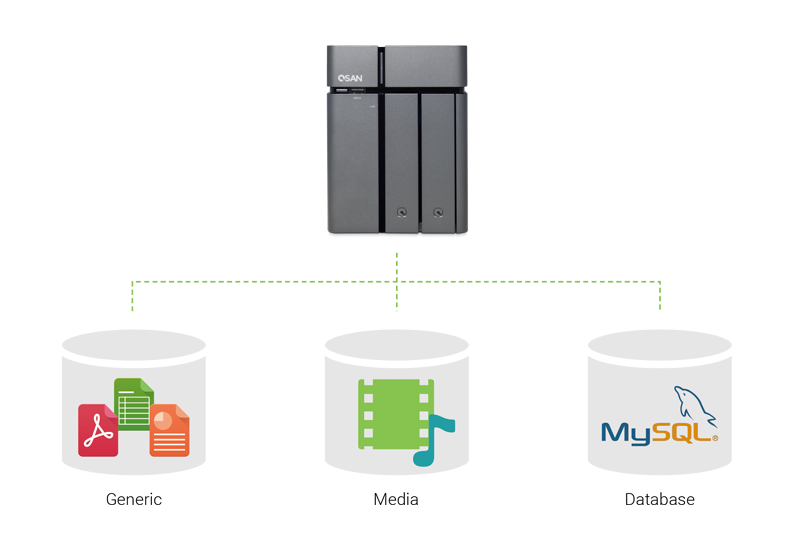 Users can be limited on how much data a folder can store or the quota can apply to the entire system, thus empowering the admin with complete control of what is stored on the XN3000T Series. 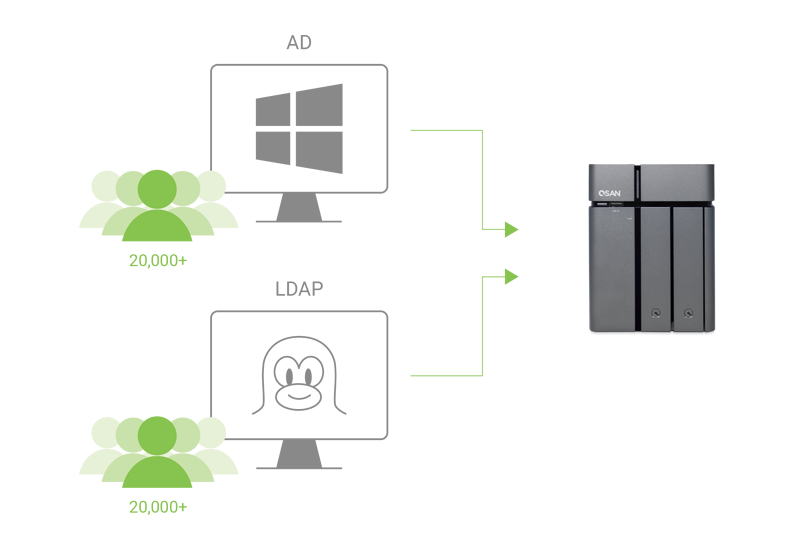 By supporting Windows AD and LDAP, the XN3000T Series enable seamless account integration. Up to 200,000 domain accounts can be joined onto the XN3000T Series and their Home folder is automatically created, helping IT administrators reduce duplicated sets of credentials and minimizing their workload in giving default account settings and new user setup. Access Control List (ACL) is a permission list specifying what actions specific accounts take on folders and files. Advanced ACL lets you set permissions on subfolders, whereas Windows ACL enables you to apply Windows file permission mechanisms on files and folders. With both kinds of ACL supported, IT administrators can flexibly regulate file access rules no matter which operating system they use, protecting your data from unauthorized access or theft. Connect/share files via the web from anywhere in the world. The XN3000T Series have a web-based File Manager that allows users to access their data and easily share it with anyone. It also provides file sharing across Windows ®, Mac ®, Linux ®, iOS, and Android platforms by supporting multiple file access protocols including FTP, SAMBA, CIFS, AFP, NFS, and WebDAV. 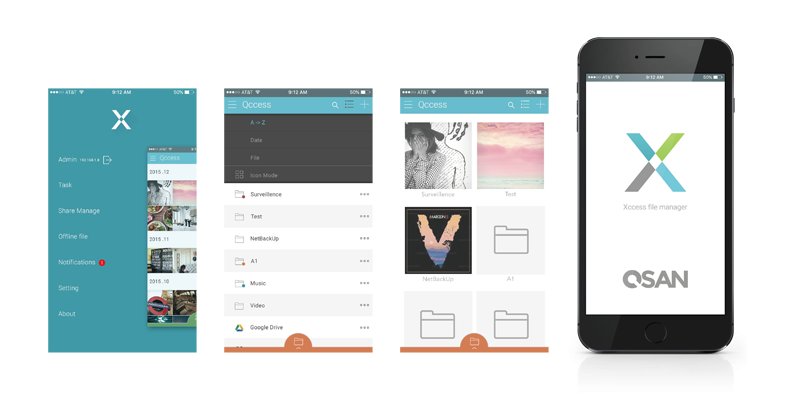 Third party cloud services supported (Google Drive, Dropbox and OneDrive). The XN3000T Series effectively addresse the above challenges by providing comprehensive and effective backup solutions that assist you in designing a complete and efficient backup solution to minimize the risk of data loss. 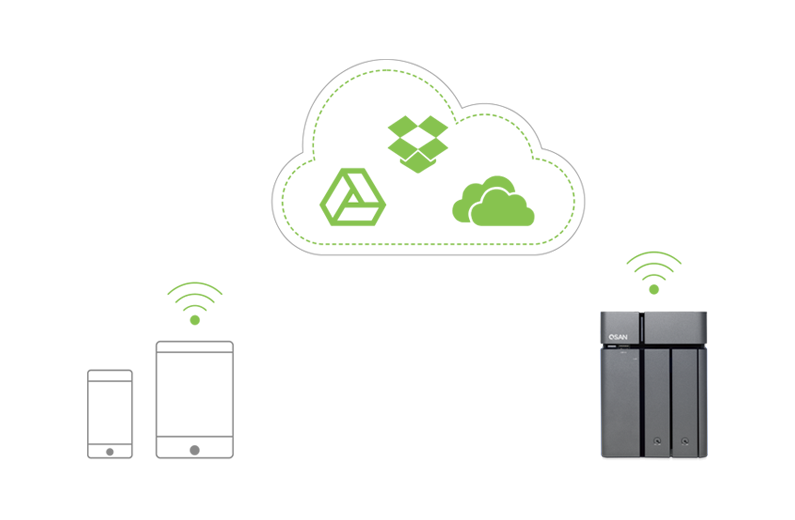 Various storage devices, remote servers, public clouds, and even other XCubeNAS can be seamlessly integrated into your XN3000T Series, achieving an all-encompassing backup solution allowing data to be free and safely and efficiently preserved. The most common cause of data loss is HDD failure, OS crashes, or most commonly, accidental deletion. Comprehensive data backup is the solution to all your data loss woes. 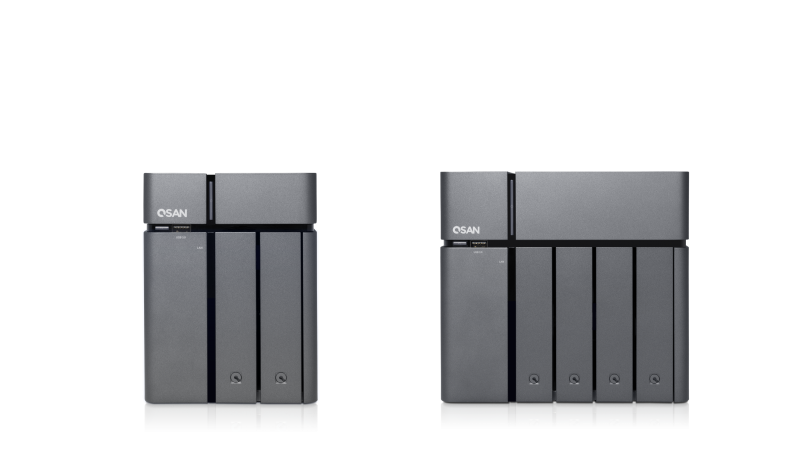 Backup all your data on your computer to your XN3000T Series with QSAN’s free utility, XReplicator. XReplicator is a free utility that is provided to help you easily backup an image of a disk, partition, folder, or file. XReplicator is also able to backup an entire PC to the XN3000T Series as a bare metal backup. 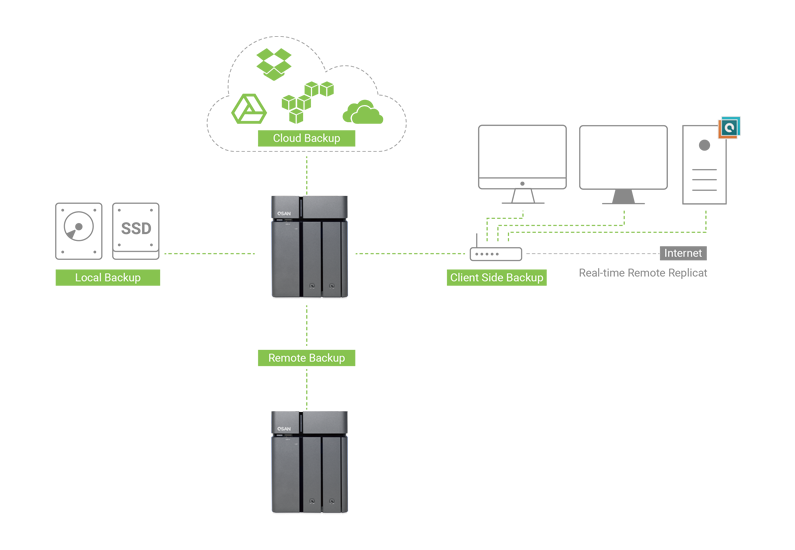 There is a way to quickly and simply recover your entire system, disk, or file when using the XReplicator utility and the XN3000T Series solution. 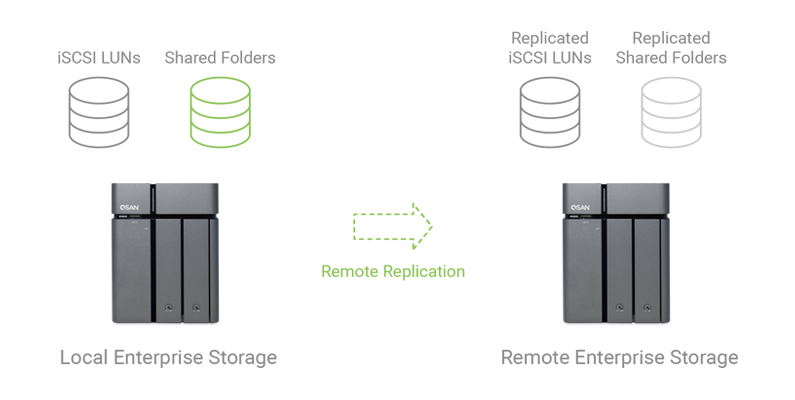 Snapshots record the status of shared folders and iSCSI LUNs as changes happen on write. By periodically taking snapshots, administrators can better control data versions and execute point-in-time recovery on folders and LUNs. These can be flexibly restored to previously known good states. Replica can transport the version information to the target XCubeNAS, enabling administrators to utilize storage space based on their retention policies and space requirements. 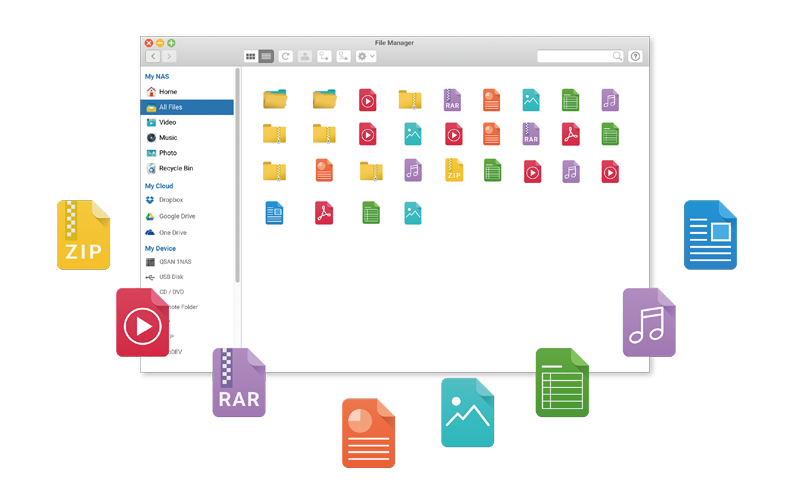 XMirror regularly synchronizes a volume or the contents of a folder between multiple XCubeNAS devices and any modification to documents will be replicated to other XCubeNAS. 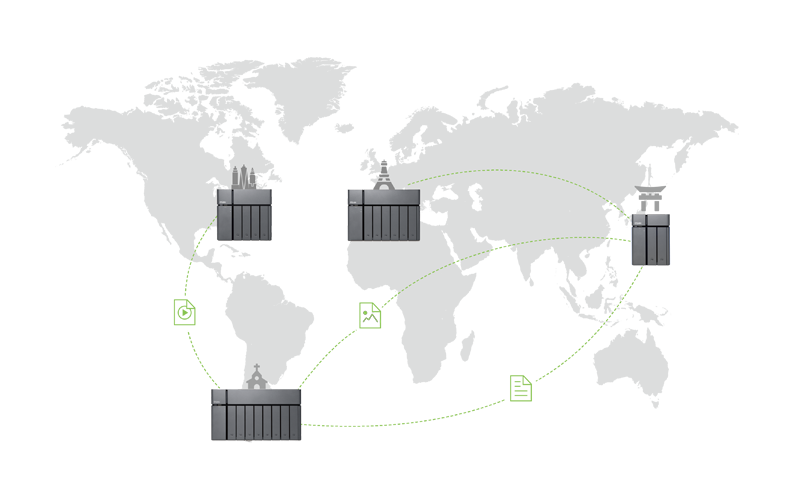 By using XMirror, data on different XCubeNAS systems, data consistency, and availability is ensured. The growing tide of data breaches, leaks, and malicious software means your data security systems and procedures are vital. Our QSM for XN3000T Series were built on a security-first ideology. It can offer you full protection of the data within your XN3000T Series. Tools are provided to protect the system from hacking, interception of data, theft, and accidental deletion. Furthermore, using the inbuilt Anti-Virus, you can add tasks, scanning the entire NAS or selected folder on a specific schedule. WORM technology is designed to prevent intentional or accidental modification of data in a certain period. 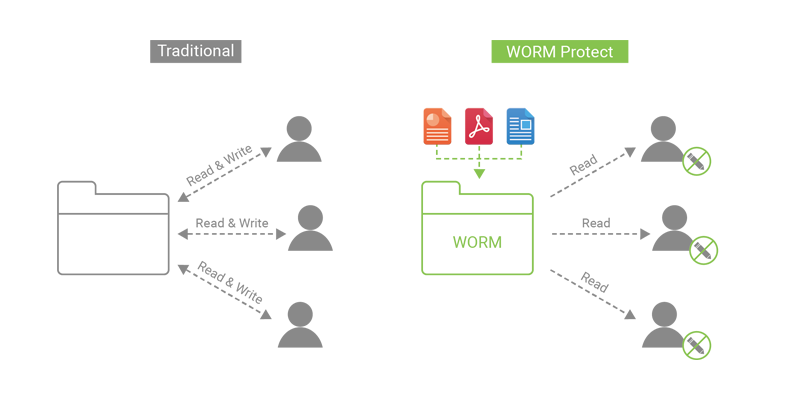 Files and folders under WORM’s protection can only be read in a user defined period. It’s unable to modify any files or folders until the period has expired. WORM can protect your data from encryption-based ransomware that installs covertly on a victim’s system and encrypt their files, making them inaccessible. WORM will protect your confidential data from unauthorized modification and threat, ensuring the correctness and integrity of your data. XN3000T Series can be much safer than you can imagine with the drive encryption technology called SED (Self-Encrypting Drive). With the technology, even if the physical drive is stolen or misplaced, the data on it remains protected against data breach by generating the authentication key (AK) to prevent the unauthorized access. 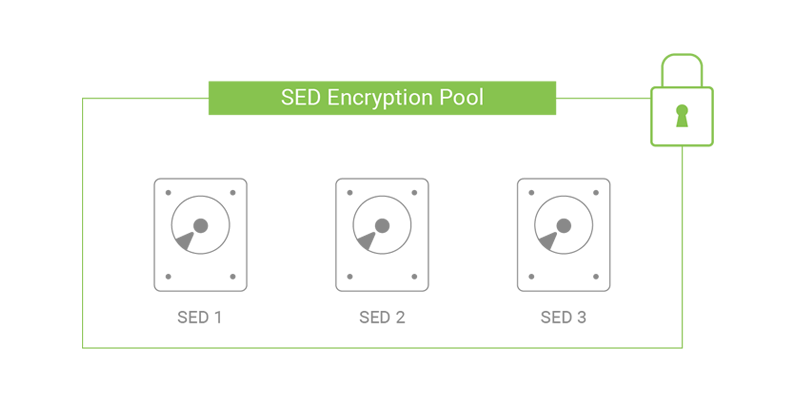 However, the SED offered by QSAN provides the secured pools migration between different XCubeNASs and easy to manage the key by exporting the AK for more efficiency. XN3000T Series pool encryption mechanism ensures secured storage environment for any user who wants to modify data must first pass authentication. 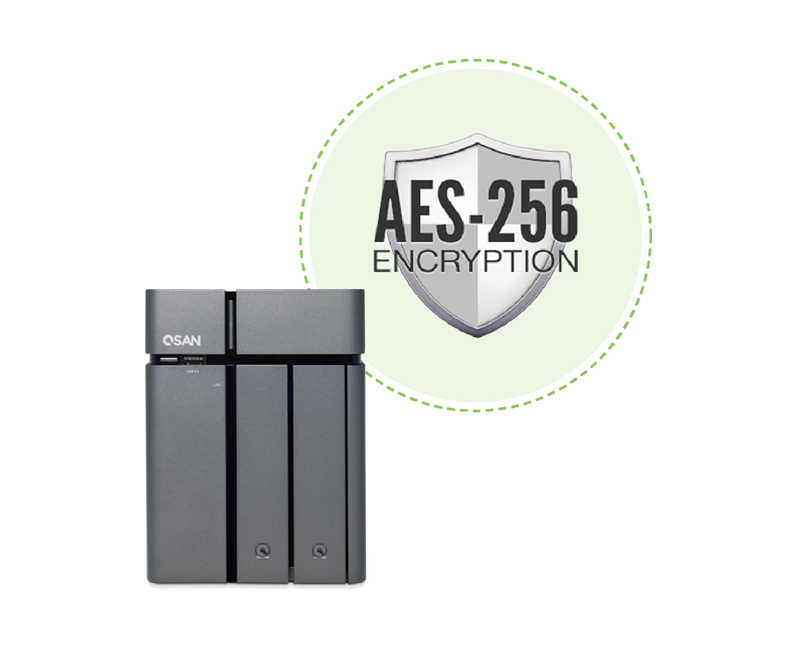 The XN3000T Series supports up to AES 256-bit encryption for internal drives and external USB/eSATA drives, and adopts a military level FIPS 140-2 validated encryption, which is considered to be the highest security certification for compliance. 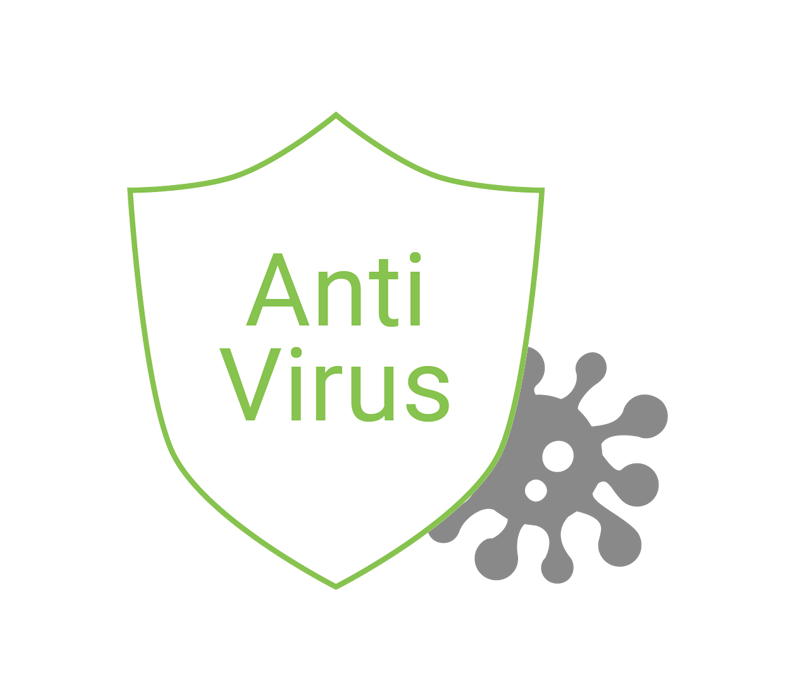 The built-in antivirus function periodically scans files, automatically quarantining suspicious files to protect the system from potential threats. XN3000T Series provide free DDNS services so you can pick your own domain name and easily connect from anywhere. This is rather useful when your broadband has a floating IP address that changes frequently. Furthermore, you can use your DDNS domain name to access your XN3000T Series via the Xccess Mobile app for Android and iOS. If your NAS is located behind an NAT router, you can enable UPnP port-forwarding to easily access your NAS.